This jackfruit curry recipe is exotically delicious and makes for a fantastic vegetarian or vegan main dish. Green jackfruit (purchased frozen or canned) is remarkably similar to the consistency of chicken and is even referred to as "vegetable meat" in many parts of Southeast Asia. In Thailand, fresh jackfruit ("khanun"), which is a prickly-looking fruit similar to durian, can be found fresh or dried in the marketplaces. Jackfruit is very healthy, loaded with numerous vitamins and minerals, plus isoflavones, phytonutrients, and anti-oxidants. Prepare the lime leaves using scissors to cut out the hard central stem; discard stem. If lime leaves are frozen, you can quickly thaw them by running under some hot water. Place all paste ingredients together in a food processor or mini-chopper and process well. Alternatively, you can pound the dry ingredients together using a pestle and mortar, then add wet ingredients to combine. If you do not have either of these tools, simply mince dry ingredients finely by hand, then stir to combine them with wet ingredients in a small bowl. Set paste aside. Cut jackfruit into desired bite-sized pieces, either in strips, cubes or chunks (as you would with chicken). Set aside. Place 2 tablespoons oil in a wok or deep frying pan over medium-high heat. Add the onion and stir-fry 2 to 3 minutes. Add a little of the wine (1/2 to 1 tablespoons at a time) instead of more oil whenever the pan becomes dry. Add the bell peppers. If using unripe and green jackfruit, add it now as well. Continue stir-frying another 2 to 3 minutes, or until peppers have softened and turned bright in color. Again, add a little wine when pan becomes dry to keep ingredients frying nicely. Add the paste you made earlier, plus the coconut milk (start by adding 1/3 can). If using ripe or prepared jackfruit, add it now. Stir well to combine. Reduce heat to medium-low, allowing the curry to gently simmer 2 to 3 minutes, or until ingredients are nicely cooked, but not too soft (bell peppers should still retain their firmness and color). 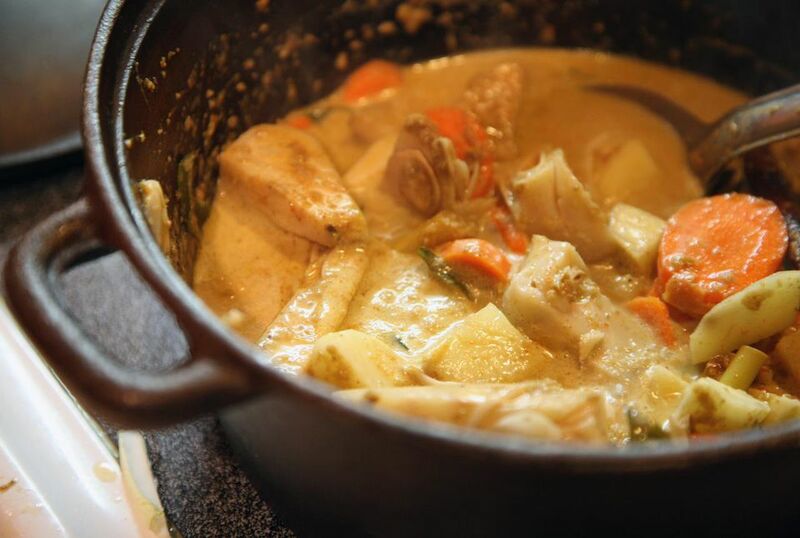 Try not to overcook this curry, or you will lose the fragrance and taste of the paste. When done, the green jackfruit should shred easily (like chicken). If using ripe, unsweetened jackfruit, it should be soft but not mushy in texture. Just before serving, add the cashews, gently stirring them in. Now do a taste-test, looking for a balance of salty, sour, sweet and spicy. If not salty enough, add more fish sauce, soy sauce or a little salt. If too salty for your taste, add another squeeze of lemon or lime juice. If not spicy enough, add more fresh chili. If too spicy (or if you prefer more sauce), add a little more coconut milk. Add a little more sugar if too sour. To serve, either portion out into bowls or onto plates, or ladle the curry into a serving dish. Sprinkle with generous amounts of fresh basil, and serve with plenty of Thai jasmine-scented rice.